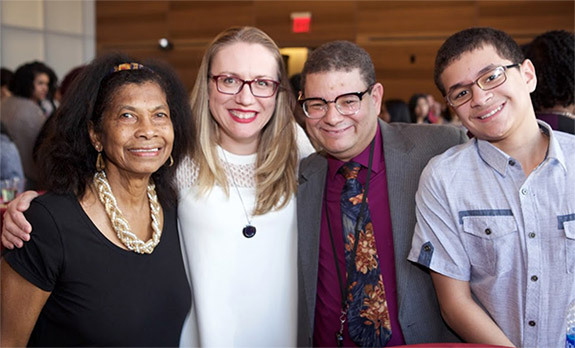 It’s been 25 years since the Ronald E. McNair Postbaccalaureate Achievement Program was first launched at John Jay College, and to celebrate the program’s outstanding track record of getting students accepted to Ph.D. programs, a series of events were scheduled through the spring semester. In late March, the McNair program hosted an alumni panel in which current students heard directly from two McNair alumni who attained doctorates, Dr. Albert Gamarra and Dr. Jessica Armstrong. In front of an audience of students and faculty members, Gamarra and Armstrong discussed how the McNair program prepared them for success in their Ph.D. programs. Dr. Armstrong agrees that McNair prepared her well for her Ph.D. program, and it was because of an internship she had as an undergraduate student at John Jay that she applied to a Clinical Psychology Ph.D. program at Clark University. “I realized I was curious and passionate about learning how to treat substance abuse disorders,” she said. Now, Armstrong is completing a postdoctoral fellowship at Yale University.